This Saturday began with an early start. I like early starts on Saturdays. It helps squeeze even more happy out of one of the already happiest days of the week. The plan was in place for a little adventure with my NS BFF and there was a very exciting citrus fruit delivery scheduled, too! After the crazy, seemingly never-ending winter, we were at risk of scurvy at Chez Peady, so this was a very exciting delivery indeed! See? Gorgeous Minneolas. Totally worth waking up early on a Saturday, wouldn’t you agree? 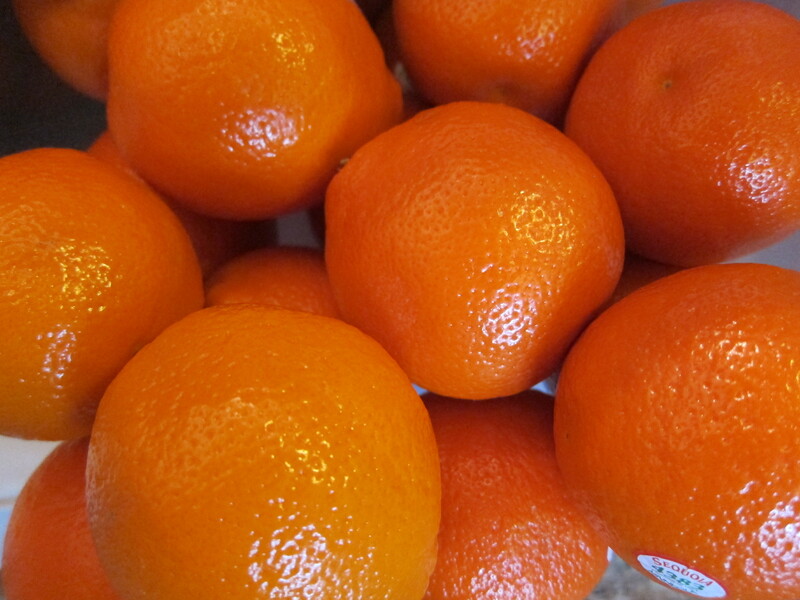 They are like sweet nectar of the gods and have the added benefit of allowing us to live a scurvy free life! Yay! Even as these delicious Minneolas and yummy Red Grapefruit were being delivered by a very kind friend and her girls, the weather tried to dampen our moods. It began to rain. Yes. Honest to Citrus! It started freezing raining! Thank goodness the fruit was already in my possession or I might have cried. So, with ice pellets falling and a sweet friend and her darling girls off to make more deliveries I was walking on citrus sunshine! My NS BFF was supposed to arrive shortly thereafter and I had a lot of fruit to stow, so I got to work (meaning I dropped off the boxes and let my husband figure it out while I got ready to go out for the morning), but then received a text from the aforementioned BFF. “Rain check?” (Isn’t she a hoot?) We tossed around the idea of skipping our outing, but decided we would go anyway and rely on the weather forecasters’ ability to keep us safe. Yeah. We are risky like that! Here are some of the wonderful things I saw (and possibly ate*) (Who’s to say?) on this – my very first – visit to the Alderney Landing Farmer’s Market in Dartmouth, Nova Scotia. Bread. Oh. My. Word. You can bet these baskets were empty by days end! This was a nice touch. Live bees in action. The wonderful fruit of their labour. There were a LOT of different flavours! Lots of interesting sights and sounds. Delicious Saronn’s Kitchen Fresh Peanut Dressing. Look at these salad rolls. Yum! Apple Cider from “the” Valley. Pat’s Preserves on the shelf at Noggins. Fun things for the kiddos! This was about to be an octopus. A treat to eat? Nope, soap. Yum! The most aptly named soap company ever. This stuff smells sooooooooo good. All of it! The name! Oh my! So funny! I want this bird house! Isn’t it unique? Star Wars Angry Birds! How cute!! This apron reminded me of a friend. Not quite sure what this is, but it seemed nice. Oh yay! Wait. What? Ohh! How cool is this chain carved from a single piece of wood? Mint chippy marshmallows. Soft, delicious, sugary pillows of confectionary artistry. Really BIG pieces for $1.50. We had a great time wandering around the market and checking out all the vendors. I was quite surprised that there was so much in there and such a great variety of goods. From art to apple cider and photography to fudge and lots of things in between, this little gem on the Dartmouth waterfront is definitely worth checking out. So, how was your Saturday? Do you have a favourite day of the week? Or a day that just seems best for getting good work done? Are you just so ready for spring to *actually* spring? Or has spring started springing up where you are? I’m happy to report that today was sunny and there are definite signs of spring popping up each day. Orange you glad that winter’s gone? *Some of the yummy things we sampled were from Maritime Marshmallows, Fudgy Chicks and Scotian Bee Honey. **We supported at least five local businesses and that always feels good! Local love is the best!